Water is one of the six essential nutrients that is often overlooked and forgotten. Water is so important to our health and after viewing the Fed-Up documentary, I wanted to show my students why it’s a better alternative to their sugar laden soda and juices. This lesson can be used as a follow up to sugary beverages or it can be used as a stand alone lesson. 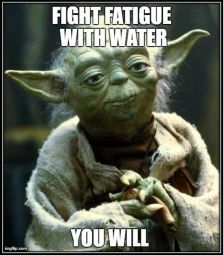 Either way, the emphasis is on the role and importance of water in our diet, using Memes as a fun, humorous way to generate the message! You’ve been asked to participate in an experiment called “Stranded” where you will be dropped on a tropical island with no food or drinkable water. This island has no vegetation or inhabitants. Prior to the start of this experiment you must select one of the following to take with you: A box of food or A box of water. Which will you select and why? Share and discuss responses. If you chose water, what would happen? If you chose the box of food, what would happen? Show students the Ted-Ed video “What would happen if you didn’t drink water?” and have them fill in the video guide sheet. After going over the answers from the video guide sheet, have students use the information to create 2 Memes using the very user friendly Meme Generator at this website. One meme should be a “Did you know…” fact about the importance of consuming water. The other meme should be a creative slogan for a water campaign geared towards teens to drink more water. See the guide sheet for criteria. Memes are a virtual way to share an idea. They use images and can be humorous and obvious or more serious and deep. Students will download their Memes, save them in their picture files and insert them into a WORD document. Print the Memes off and write a brief response explaining the facts and slogans you selected. After grading, hang memes around the school for the entire student body to view. Place meme water campaign facts and slogans in places such as bathrooms, locker rooms, weight rooms, the nurses office, over the water fountains, in the cafeteria, on the drink machines and classroom doors. Some students will inevitably say that they don’t like water because it has no taste. Prove to them that water can be easily flavored fruits and vegetables (which also contain water) by having students participate in a Water Challenge: Flavored Water Lab. Each group will select a flavored water to prepare in class and then taste test each group’s flavored water and take a survey to see which water flavor is most preferred. Ideas for flavored water can be found here and here.